During the Cold War no one was keener on deterring the Soviet Union than Guido; Trident, Pershing and Cruise missiles meant that the Red Army stayed in Russia. That deployment and the threatened development of the Strategic Defense Initiative bankrupted the USSR and ran up the US deficit, prompting Ronald Reagan to quip that he didn’t worry about the deficit, it was “big enough to look after itself”. Britain’s ageing sea-based Trident fleet is up for replacement and the price tag is expected to be £100 billion of borrowed money. With no super-power enemy threatening the defence of the realm this is an expensive bit of willy-waving in an age of austerity. Even conservative US military strategists question the logic of the UK spending a third of the defence budget on a Cold War era system at the expense of conventional forces. 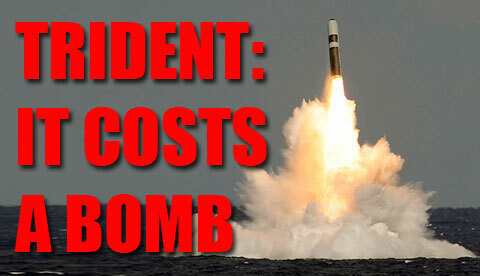 Trident will cost every man, woman and child in Britain £1,400 that will have to be borrowed. The French manage to have a modest nuclear deterrent without paying the Yanks billions they can’t afford; the Force de Frappe and the Force Océanique Stratégique. Surely Britain can as well?